Burgers. The word can mean a whole paragraph to a lot of people. Growing-up my dad was very lacking in the cooking department, so much so that he was able to ruin boxed macaroni and cheese on multiple occasions. However, he completely redeemed himself when in came to the grill. Not just any grill, it had to be charcoal and it had to be done just so. I'm not exaggerating, there was a whole art. The hamburgers that my dad made on the grill where a treat and one of my favorite foods growing-up. I didn't think I would ever meet another man so much in love with his grill and grilling. Then I met my husband. Over the years I have heard rant after rant after rant about the superiority of a charcoal grill and how great hamburgers can be when done right. In the summer we still grill a lot, but in the winter I have moved our grilling indoors. I agree with my husband and dad that the taste isn't as great, but my feet stay warm and the burgers are still delicious even when done on my indoor open faced electric grill. In the summer we will go back to the giant grill and side smoker, but in the meantime we will enjoy our chicken and beef inside. 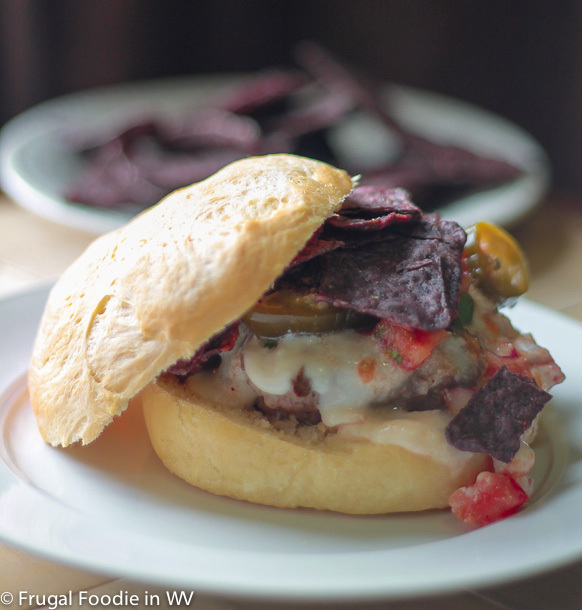 This week I tried a new recipe for Nacho Burgers from the March 2013 issue of Food and Wine magazine. 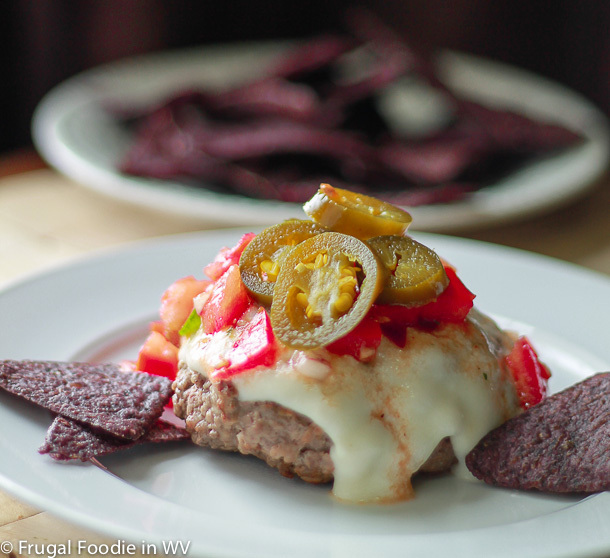 This recipe has 7 ingredients in the salsa, 8 in the cheese sauce and 7 ingredients for the actual burgers. It takes 35 minutes of total time, all of which is active and makes 4 servings. I did make a few changes to the recipe. First as I try to always do I ground my own beef. It really takes very little time to grind your own meat either in a food processor or like with the attachment I use on my mixer. The texture is phenomenal and the quality is significantly superior. Instead of using store bought buns I made my hamburger buns from scratch. They are easy to make and are great for sandwiches. Since I eat gluten free I substituted brown rice flour for the all-purpose in the cheese sauce. When making the sauce add a little bit of milk at a time in order for the sauce to thicken correctly. If you add the milk all at once it will be too thin. I substituted non-fat milk for the milk in recipe since it is the only milk we keep in the house. I cooked the burgers on my indoor electric open faced grill. The cooking time was slightly longer, especially since I make sure that my burgers temp correctly since my kids are eating them. Food and Wine magazine claim that these are the best burgers ever. Hmm. I did think that the toppings were delicious, the cheese sauce was nice and the salsa was great both on the burger and with the chips as a side. However, it would be a stretch to say it is the best burger I've ever had. The actual patty is just plain beef, no fillings, no nothing. I think that the recipe could be improved by adding more to the patty itself, such as cayenne, garlic powder, ancho something that keeps the flavor but also adds a little bit of moisture. It would be nice if the cheese sauce was in the burger instead of on top, incorporating the cheese or adding more to the burger itself would take this burger from being okay to being great. My husband would love these, he's the spicy one in the family. They look delicious. That homemade bun looks delish! I'm still drooling over the gourmet burgers I made a couple weeks ago! Thanks :) They were really yummy, I love making homemade breads! NO WAY! This is awesome. It combines two of my favorite things in the whole world - burgers and nachos. I am a huge nachos fan also, love them! This looks yummy :) Home made buns are such a hit always :) Thank you! This looks so good! I love spicy burgers! Thanks for stopping by and the heads up! Look at these photos?! Amazing!! Nice skills! Thanks for sharing at Foodtastic Friday! I need. I need! I could have this for breakfast! Awesome! I love hamburgers!Great pics. Thanks :) I love hamburgers also, yum! My dad too, always used a charcoal grill. Your hamburgers rock! Thanks :) Glad that my dad isn't the only one! Everything you make looks so good! I still can't believe you make all your own buns. Awww, you're so sweet thanks :) The buns are actually really easy I promise! Plus they are so much cheaper! I found your blog through Aloha Friday. I love your blog! I like your recipes, looking at the beautiful photos you do, I just want to go for cooking right away! New follower here. I give you the link to my blog, if you like my projects, I invite you to follow me. Thanks for the sweet comments :) Going over to check out your blog now! Come back again soon and find some new recipes to try! These burgers look great! And I appreciate your review of the original recipe as well! Thanks for sharing on Foodie Friends Friday!